As a PodcastOne Premium member, you have access to complete archives, thousands of podcasts with limited commercials, and access to exclusive content. 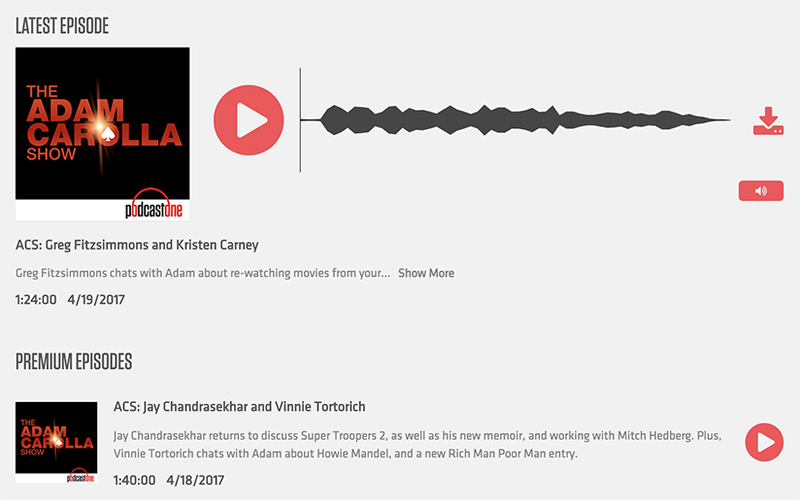 Log into your PodcastOne.com Premium account and click on PODCASTS from the top menu to checkout all the cool podcasts available. On the All Podcasts page, click a podcast to see the program page. Click "Select Category" button to see the categories available or click the list icon to see a full list. Click a podcast to view the LATEST EPISODE and PREMIUM EPISODES available. 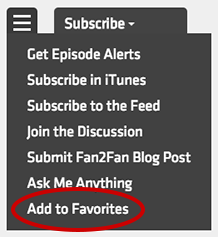 On the program page, click the menu and click "Add to Favorites" to add the podcast to your Favorites list. Log into your PodcastOne.com Premium account. 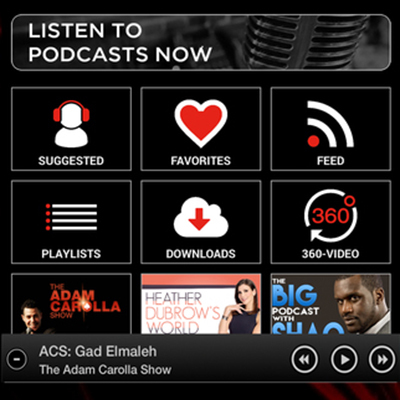 From the homepage, click the "View More" red button under "PodcastOne Premium: Members Only" to access members only content. In the Members Only page, click "Select Category" menu in the top-left corner to filter by program. Click play to listen or watch an episode. On the All Podcasts page, click a podcast to see the program page. Click "Select Category" menu to see the categories available or click the list icon to see a full list. To listen on the program page, click the play button. To listen to a different episode, click on any other episodes available on the page and click the play button to listen. 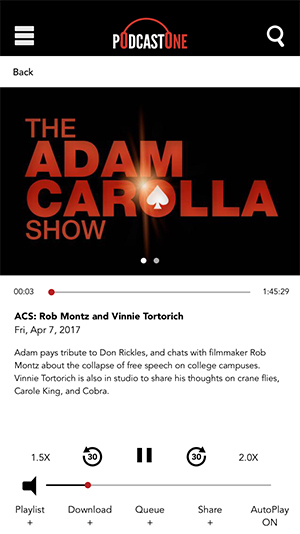 To access the full list of episodes, click "Show More Episodes" button. To download the episode, right-click on the download icon and click "Save Target As" or "Save Link As" (depending on the web browser you are using). This will open a dialogue box, select where you would like to save the file on your computer, and click the "Save" button. This will start a download process of the MP3 file to your computer. Once the file has completed downloading, you can listen to the file on your computer, or transfer it to your MP3 player/device. On the program page, click the "Subscribe" menu and click "Subscribe in iTunes" This will open up iTunes. 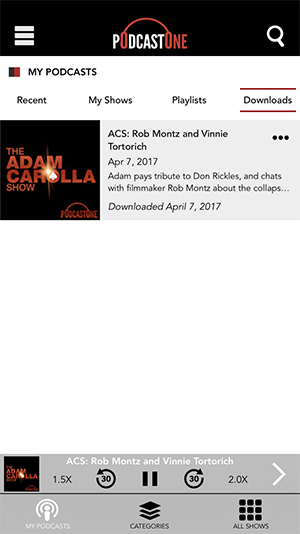 In iTunes, click on the triangle next to the podcast to expand it to premium episodes to download. Click the "download" button to save the episode to your computer. On your mobile device, open the PodcastOne App. You can download the iOS version or Android version. From the side menu, tap "Premium Membership" to join as a premium member. If you are already a premium member, tap "Log in" to log into your premium account.  Once you are logged into your premium account, use the Search tool to search for your favorite podcast or tap All Shows from the bottom menu to see all the premium episodes available. Tap Categories to browser by category. 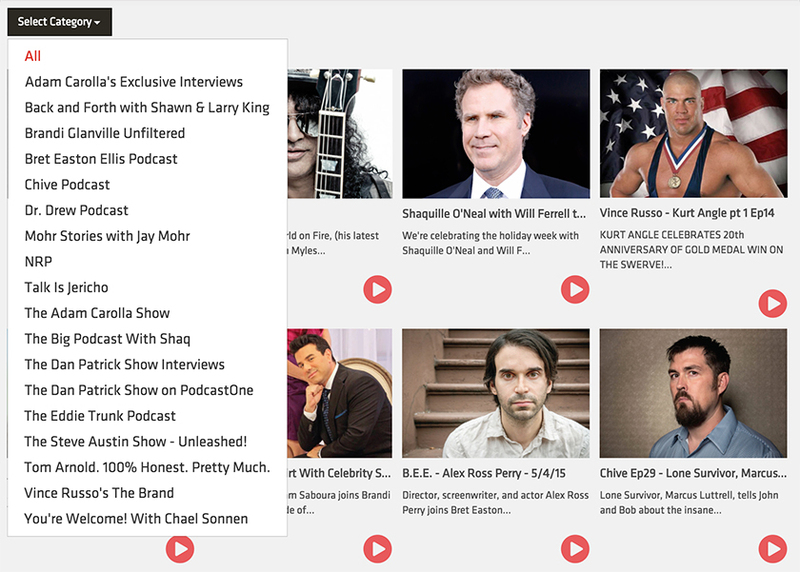 Tap a podcast from the list to view all Premium Episodes available. 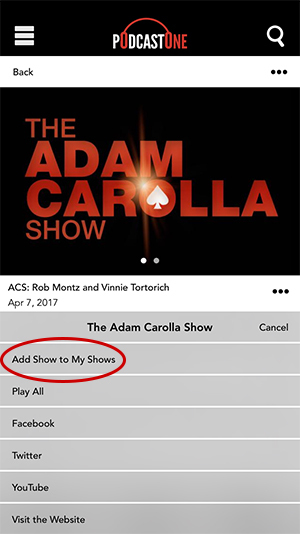 On the program page, tap the Menu in the top-right corner and tap "Add Show to My Shows" to add the podcast to My Podcasts and tap "Ok."
On the program page, tap the name of the episode to stream it over your Wi-Fi or cellular Internet connection. To download an episode so that you can access it when you're not connected to Wi-Fi or an Internet connection, tap the "Download" link. You can also add episodes to your Queue or create a custom Playlist. After you've enjoyed a downloaded episode, you can save it or remove it from your mobile device. To remove it tap on My Podcasts and tap on "Downloads." Then, swipe left on the episode you want to remove and tap Remove. If you have any questions about podcasting on PodcastOne.com, please contact Customer Service for assistance.